Save up to 30% on new Brother printing machine with the Switch to Tank Promo! 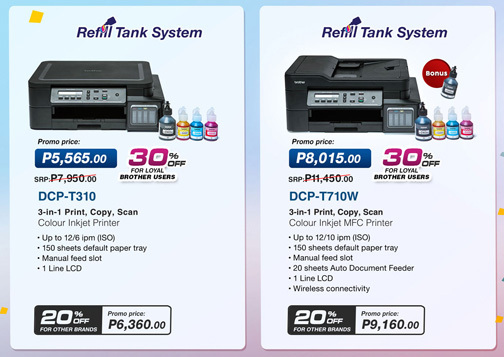 Brother Philippines has just launched its latest “Switch to Tank” promotion where customers can save as much as 30 percent on prices of select models of brand-new Refill Tank System printers and multifunction centers (MFCs) when they trade in their old Brother machines, and 20 percent off when they trade in their old non-Brother machines. Acceptable machines for trade-in are typewriters, printers, fax machines, and all-in-one printing products – working or non-working. Customers may avail of the promo starting February 12, 2019 during the Switch to Tank Promo roadshows. Refill Tank System models DCP-T310 and DCP-T710W are available at 30 percent off for customers bringing Brother Trade-in machines, and at 20 percent off for those trading other brands of machines. Meantime, customers trading either Brother or non-Brother machines can get 20 percent off on MFC-J2330DW and MFC-J3530DW A3 Colour Inkjet Multifunction Centers. They can also get the MFC-L2740DW Monochrome Laser MFC at the same discount, available in Metro Manila only. Catch the Switch to Tank promo at the following roadshows: SM Cebu (Lower Ground Floor); SM Manila (Cyberzone); SM Pampanga (Ground Floor, between Starbucks and Red Ribbon); SM Bacolod (Cyberzone, fronting Foodcourt); SM Davao (between Pizza Hut and Watson’s); and SM Megamall (3F Bridgeway). For more information on these roadshows, visit Brother Philippines’ official Facebook page. Customers can avail of additional freebies by scanning the QR code that they can see in Switch to Tank promotional materials like flyers, digital posters, and billboards and pre-registering at promotions.brother.com.ph. For more promo details, customers may visit the Brother Philippines’ official Facebook page (Facebook.com/BROTHERatyourside); call the Brother Helpdesk Hotline at (02) 581-9898 or the toll-free hotline at 1-10-BROTHER, or send an email to [email protected].